On saturday, the 30th of september 2017, the 45th IBCT will host its seventh annual “Half Marathon” and 5k run/walk in recognition and remembrance of the eighteen brothers and one sister from its ranks who made the ultimate sacrifice since September 11, 2001. The race course is located in Oklahoma city, OK, to facilitate a larger participant population . 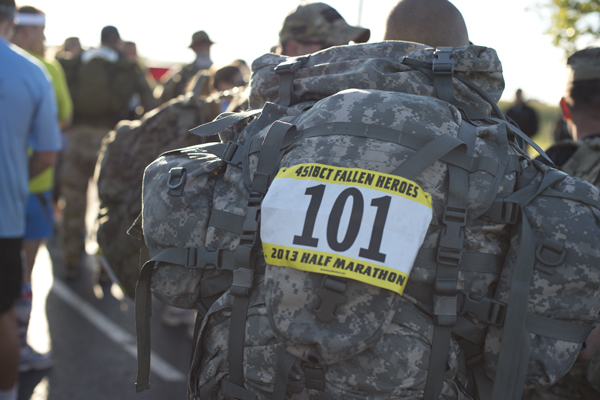 The nineteen fallen heroes will be honored individually with recognition beginning at the Starting Line, then at each mile marker along the 13.1 mile course and finally at the finish line. A banner will be placed at each of the 15 points highlighting one of the warriors with a photo and brief bio detailing their lives and sacrifice. The proceeds from this event will be presented to the National Guard Association of Oklahoma and will be earmarked for the Fallen Hero Family Member Scholarship fund established in 2012.